I was bought Caitlin Moran’s book “How to be a Woman” for Christmas. It’s not the sort of book I’d usually read, but it was looking abandoned on the bookshelf, so finally decided to pick it up. It had a very rare effect on me – it made me angry. It’s half autobiography, half about Moran’s views on feminism and its main theme is her opinion that world these days is still a difficult one for women because although we may have the vote and be able to go to work, we’re still all hard done by and need to wake up and realise how subjugated we all still are. Although feminist Moran has now broken though, and is living the life we all want to live, where she is confident, independent, has a partner who shares in her life rather than controls it, and essentially feels she can behave how she wants, there are lots of other women who can't break through. She discusses themes of “being a woman” and describes how Western women seem to live double lives - where outwardly they're happy, independent and confident, but actually they exist in some archaic nightmare, spending forever and a day doing their hair before going to the shops, not stepping out of the house without their make-up done and their fake tan applied, hating wearing heels but having to, being the downtrodden one in relationships, being criticised by the masses if they decide not to have children, being considered on the scrap heap once they go through the menopause and generally not achieving anything. There was a quote about women just BEING not DOING – we exist but don’t actually contribute anything. What made me angry was the assumption (maybe the reality) that the majority of women are actually still living like this in the Western world. It's a totally alien concept to me - that's not the life of anyone I know, but the idea that there are still women and girls out there who can't behave as they want to, even when they live in countries and under political regimes where they have total legal equality, is appalling. Whether it's true that life is still like this for lots of women, and that they are still subjugated, to be honest, I don't know. 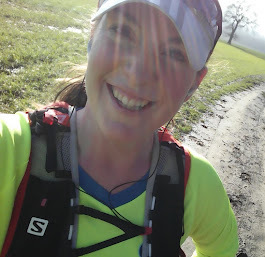 What I do know, though, is that running marathons, and particularly ultras, has, without a doubt, changed how I perceive life and how I feel about myself. It’s opened my eyes to a world where men and women compete in the same event, and sometimes the women win, but where, in fact, no-one seems to care whether you’re male or female because actually we’re all just runners; where you can wear no make-up and be covered in mud and sweat and look the messiest but the best you’ve ever looked and are considered amazing because of what you’ve just achieved! 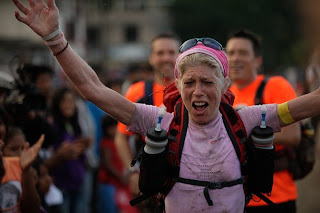 The running community has given me incredible male and female role models, from every age group and background, and has taught me the value of dedication and hard work, of setting the most ridiculously lofty goals, which everyone around you actually encourages you to aim for, and then the joy of achieving them after putting your heart and soul into months of working towards them. It has also make me realise and truly appreciate just how wonderful other people are - how supportive, caring and selfless they can be to someone they don’t even know yet. No female marathon runner I have ever come across is anything like the negative descriptions of subjugated women portrayed in Moran’s book. It deeply saddens me if it's true that girls are growing up thinking they need to become a WAG or a reality TV personality to be successful, or just to be considered “normal” they have to subject themselves to wearing heels they don’t like or plastic surgery they don’t want, and a lifetime of supporting their man instead of actually achieving their dreams. If they were exposed to the running culture, surely it would help to counteract the negativity of the celebrity and patriarchal culture that Moran tells me we’re still living in. This is exactly why it always pleases me to see children at running events, like the RDs' children who help out at the Challenge Running and Enigma races. Exposing them to our world must surely inspire them – not necessarily just with the actual running, but with of those other things that are more important – that age, gender and appearance are irrelevant and it’s all about working hard, looking after each other, and pursuing your goals. I’ve decided - running could change the world – we need to get everyone else to realise it.